IDICBeer 40k: Games Workshop Profits! It seems like all the extra releases have paid off for Games Workshop! 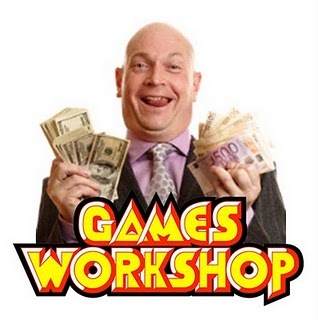 "Games Workshop have reported a 2.7% increase in revenue to £134.6m for the year to 02 June 2013. Pre-tax profit increased by 9.7% to £21.4m for the same period"
I really hope that this profit will encourage positive changes within the company and maye it might lead to a more community oriented company. We have all accepted that the hobby is not cheap and is never going to be cheap, but in return; all we want is a little love back from GW which quicker turn around on codexs is really helping with. "taken for a ride"... well, we all know how to get out of that ride, don't we. the question is, are we willing to do so? if not, who is to blame GW to take advantage of that... "milking the cow every morning"
this year has seen quite some releases and a lot of work has been put into it in advance, a lot of money has been invested in artists, moulds, people, etc. This money came from somewhere, and this "somewhere" likes to see money coming back. making profits means that investors will be happy, and will invest again. so that there will be new releases...who would not like to have another SM über-chapter? 3% increased sales would probably fail to match inflation, or even the price increases over the last year. Or the increased prices for the new releases (Tau and Eldar) particularly in the US market, where there has been a noticeable increase in their prices to more closely match Australian pricing (probably to stop discount selling internationally, since the UK pricing hasn't changed). Also if they only managed 3% with the major releases in the last year there is something majorly wrong. Also the only market that really saw growth was the US, which is almost certainly as it is the only market still providing reasonable discounts internationally. I know people complain about games workshop prices and the huge profits they make. But that's the nature of business and that's what they do it for to make money. The prices are not to bad for the models I think it would be hard to find any other. minis out there with the same quality in plastic that GW make. "there will never be a better moment to start a new army...next year, you'll pay 10% more"
You need to look at the whole report to see the big picture. First, revenue from IP Licensing is down... not surprising with the THQ failure. Secondly, much of the 'savings' came from reducing the overhead from running stores. Third, model and book sales were flat from the previous year. So, GW isn't in financial trouble, but they aren't exactly growing either. They are loosing market share in a relatively small market. A company needs to make a profit to keep going. I don't want GW going anywhere, personally. A good question to start the fire. I doubt their profits are coming strictly from miniature sales. IP licensing and cost cutting measures maybe involved. I think I've spent less on GW this year than any most years, not out of protest more lack of money and having most of what I want, but also because I'm a little spoiled for choice.